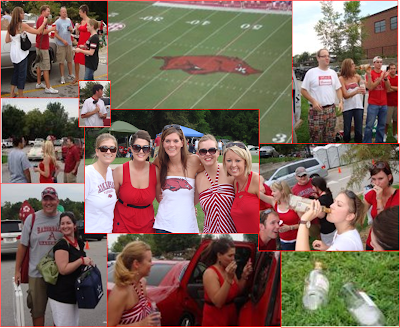 Saturday, August 30th was the first Razorback Football Game of the season! We had been preparing for it since about February when we got in the lottery for our parking spaces! We need and upgrade and Amanda got us prime parking for the entire year! Parking is important because that’s where we stay ALL DAY LONG – if the game is at 6 pm – we are out the door by 10:30 to head up to tailgate! Here’s Mike and Kenny laughing about something – they probably can’t even understand each other over the slurred speech act of 2006 but that’s ok – they thought they were funny. Danielle and Randall did a really good job on faking everyone out to make them think they could stand up straight – all that “gear” is really just part of the balancing act. Brad has a hammer for some reason – no one knew why, no one locked their keys or their tickets in their car this game, although that did happen once upon a time last year.Here’s Jennifer and Amanda gettin’ all prettied up before walking – 6 hours in the sun and the humidity does a number on your cute outfit!And here’s what it’s all about – HOG FOOTBALL! 2 more months of good times to come!